Gibson, M. J. and Gregory, S. R., Across the States 2002: Profiles of Long-Term Care, AARP, 2002. Kassner, E. and Williams, L., Taking Care of their Own: State-funded Home and Community-based Care Programs for Older Persons, AARP, September 1997. Kassner, E. and Shirley, L., Medicaid Financial Eligibility for Older People: State Variations in Access to Home and Community-Based Waiver and Nursing Home Services, AARP, April 2000. Manard, B. et. 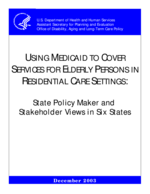 al., Policy Synthesis on Assisted Living for the Frail Elderly: Final Report, submitted to Office of the Assistant Secretary for Planning and Evaluation, December 16, 1992. Mollica, R.L., State Assisted Living Policy: 1998, Report (ASPE and RTI) June 1998. Mollica, R.L., State Assisted Living Policy: 2000, National Academy for State Health Policy; funded by The Retirement Research Foundation (LTC13). August 2000. Mollica, R.L., State Assisted Living Policy: 2002, National Academy for State Health Policy, November 2002. Mollica, R.L., and Jenkens, R., State Assisted Living Practices and Options: A Guide for State Policy Makers, A publication of the Coming Home Program, funded under a grant from The Robert Wood Johnson Foundation, September 2001. O'Keeffe, J., People with Dementia: Can They Meet Medicaid Level-of-Care Criteria for Admission to Nursing Homes and Home and Community-Based Waiver Programs?, AARP, August 1999. Smith, G. et. al., Understanding Medicaid Home and Community Services: A Primer, U.S. Department of Health and Human Services, Office of the Assistant secretary for Planning and Evaluation, October 2000. State Assistance Programs for SSI Recipients, January 2001, Social Security Administration, Office Of Policy, Office Of Research, Evaluation, and Statistics, Division Of SSI Statistics and Analysis. Stone, J.L., Medicaid: Eligibility for the Aged and Disabled, Congressional Research Service Report for Congress, updated July 5, 2002.